Through the years many cultivars (some sources say nearly a thousand) have been developed the world over. Some are white fleshed, smooth skinned, extra large size (c.v. ‘Big Jim’), strawberry flavored (c.v. ‘Strawberry’), late ripening (c.v. ‘Tanaka’), and ones with simply superior taste. One important note – varieties cannot be expected to be true from seed, therefore they must be grown as grafted plants, so buyer beware! 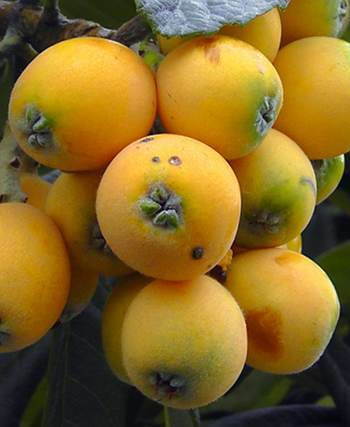 In the world Japan is the primary grower of loquat fruit, followed by Israel and Brazil. Loquat fruit has been used in a variety of ways, sometimes eaten as is (though the skin is often removed first), made into jam and chutney, canned, stewed, to flavor dishes, added to juices, or to flavor alcohol. 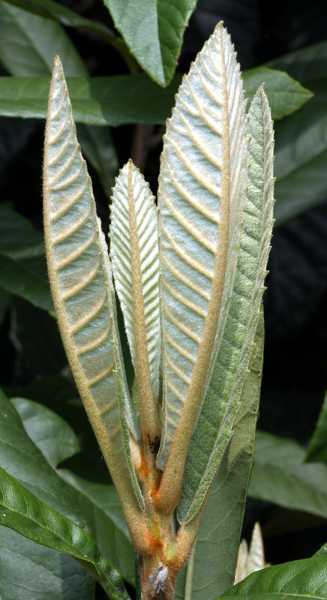 Mature leaves are dried and made into a tea in Japan, known as biwa cha (literally “loquat tea”). This tea is thought to have medical effects including keeping the skin young and healthy (a near fetish in Japan), as an aid against inflammatory diseases, as a cough suppressant, an appetite suppressant, and an expectorant. 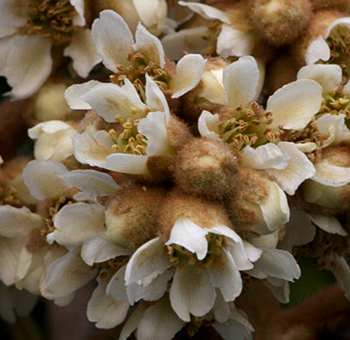 The flowers of the loquat tree are simple, with five white petals surrounding a yellow center. They flower from late fall into mid winter and are very aromatic. A word of caution to those wishing to dive into making tea from its leaves – the new growth and seeds are chock full of cyanogenic-glycosides which if eaten in quantity can lead to dizziness, headache, palpitations, difficulty in breathing, and eventually respiratory paralysis and cardiac arrest. Amazingly, the seeds of some varieties are made into a liqueur in Italy, known as nespolino. Having said all that, the fruits are completely harmless, and in fact contain many beneficial chemicals ranging from pectin, to various vitamins and minerals, and also are a good source of dietary fiber. Cultivation of this tree is fairly simple. They can be grown in full sun or partial shade in any reasonable soil that is not too alkaline in reaction. Rich loam, sandy humus, or even clay soils all are suitable, though the tree is probably happiest in loam soils. 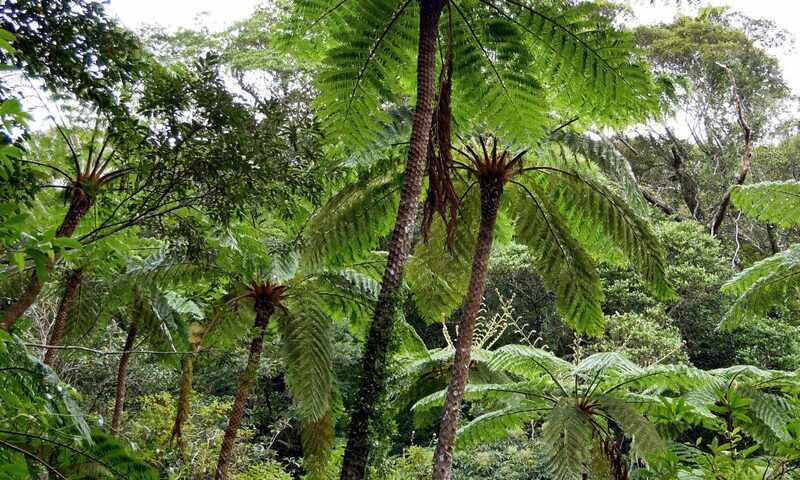 In their native homeland they inhabit moist subtropical forests that receive nearly continuous summer monsoon rains, and then a dry season in the winter months. This regimen is not completely necessary however since this is a very adaptive tree. Loquats are surprisingly cold hardy, taking down to -10 C (14 F) without trouble (roughly USDA hardiness zone 8). They can be maintained in colder winter areas with some protection during the worst weather, or if sited well, say in a protected courtyard or foundation planting. In Japan the developing fruits are covered with brown paper bags to prevent birds, insects and rain from harming them. One problem is that in areas where temperatures commonly drop below freezing the flowers can be killed and so no fruit will be produced. The limit for flower survival is said to be around -1 C (30 F), though plants that grow near my house in southern Japan (equivalent zone 9b) produce fruit even when winter lows have dipped to -4 C (25 F) on occasion. When living in north Florida (zone 8b) I noted that some seasons trees produced good crops, but in extremely cold years (the 1980’s were memorable) the flowers were killed off, though the trees remained healthy. Fruits typically are ripe by late spring (usually June in Japan), but can ripen earlier in milder climates. In Japan individual fruit clusters are wrapped with brown paper bags to keep insects, birds and rain off the developing fruits. Another issue with this tree is its tendency to become invasive. In Japan it has naturalized throughout the milder regions in low, wet forests, but to my knowledge is not a truly weedy plant. In north Florida I saw many volunteer seedlings in and around human settlements, but in more established forests their presence was limited. I cannot speak for other areas where loquats are considered invasive pests, for example in Hawaii or eastern Australia, though I imagine their invasive potential is moderate at best. I’m sure some would disagree with this. Still, care should be taken when planting this tree in humid, subtropical climates since birds readily spread the seeds after ingesting their fruits. 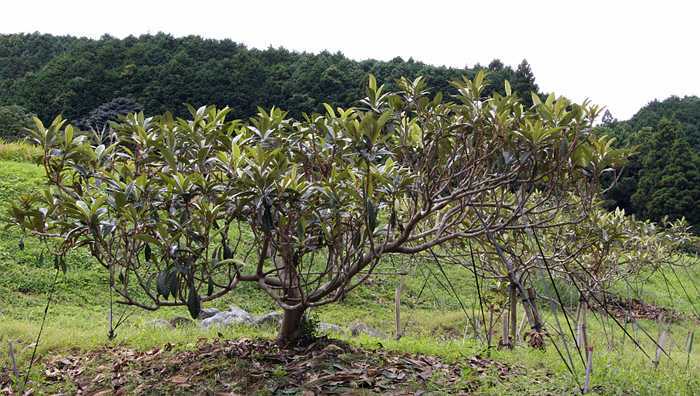 Loquat trees in Japan that are grown for fruit production are kept pruned low and the branches are pulled by ropes toward the ground for ease of picking the fruit clusters. All in all, E. japonica is lovely tropical looking tree that is both disease free and simple to grow. 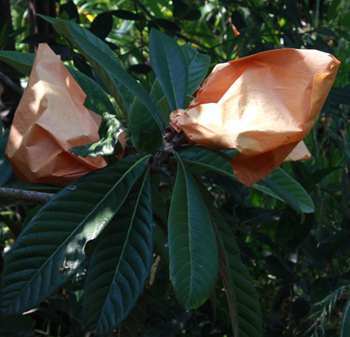 The main disease problem is fire blight, caused by the bacterium Erwinia amylovora. The most obvious symptom is infected branches dripping watery ooze from cankers. These need to be cut off immediately to protect the tree’s overall health, and to ensure good fruit production. Be sure to cut at least 30 cm away from the nearest canker, and be careful to sterilize the pruning tool between cuts – either by soaking it in bleach solution or isopropyl alcohol, or by heating the blades. Chemical controls include prophylactic application of liquid copper sulfate during warm, wet weather or applying antibiotic agents such as Agrimycin, especially during the blooming period. The disease spreads by entering natural openings in the plant tissue, in particular the new growth, but once established it can spread rapidly to older growths if left untreated. The loquat is a lovely ornamental tree with the added bonus of producing large amounts of delicious, sweet fruits. Here’s another “Japanese” tree that deserves a try in suitable gardens around the world.